Be prepared to repair pipes with the Emergency Pipe Repair Clamp – The quick, easy, and professional way to temporarily repair a burst, perforated, or leaky pipe. This Emergency Pipe Repair Clamp is a great item to have in virtually any building. In cases of emergency, such as when a pipe has burst in an area where the water supply cannot be shut off, this clamp can reduce water damage and save a lot of time, energy, and money, not to mention water! Simply open the device, center it around the problem area, firmly close both housing members, engage the latch mechanism and close the device around the problem area with a squeeze of your hand. 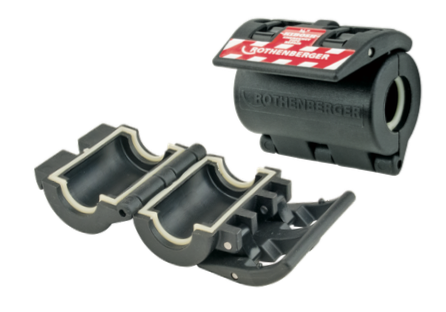 Know someone who needs the Rothenberger Repair Clamp in their toolbox? Share the Pipe Repair Clamp PDF with them!